Has the day of reckoning arrived? 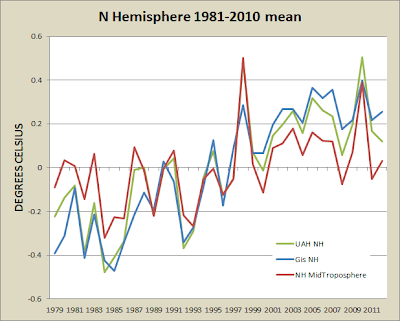 I originally miscontrued the WUWT article and charts as referring to global surface temperatures. However, in the comments below, Ryan pointed out my error. The examples on WUWT are only for the tropics and only for the mid-troposphere in the tropics. I was going to leave my post with all the edits as is, but it's too messy. So I've revamped it. Recent studies have examined tropical upper tropospheric warming by comparing coupled atmosphere–ocean global circulation model (GCM) simulations from Phase 3 of the Coupled Model Intercomparison Project (CMIP3) with satellite and radiosonde observations of warming in the tropical upper troposphere relative to the lower-middle troposphere. These studies showed that models tended to overestimate increases in static stability between the upper and lower-middle troposphere. We revisit this issue using atmospheric GCMs with prescribed historical sea surface temperatures (SSTs) and coupled atmosphere–ocean GCMs that participated in the latest model intercomparison project, CMIP5. 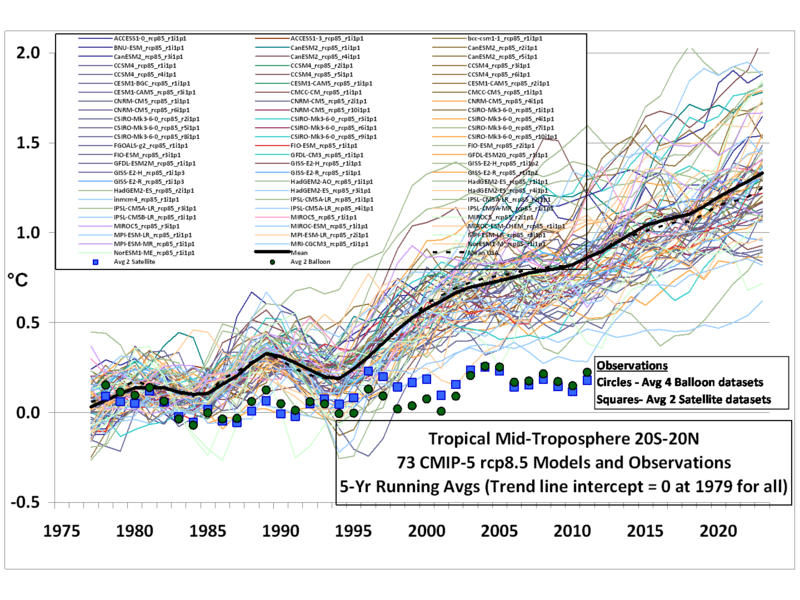 It is demonstrated that even with historical SSTs as a boundary condition, most atmospheric models exhibit excessive tropical upper tropospheric warming relative to the lower-middle troposphere as compared with satellite-borne microwave sounding unit measurements. It is also shown that the results from CMIP5 coupled atmosphere–ocean GCMs are similar to findings from CMIP3 coupled GCMs. The effect of internal uncertainty related to the dataset construction is large (Christy et al 2003, Zou et al 2009, Mears et al 2011), so it is possible that the differences between GCMs and observations are byproducts of the merging procedure for satellite observations. It is unclear why the interannual amplification ratio should be different from the decadal amplification ratio, but MSU observations show less amplification on decadal time scales (figure 4). We also note that NOAA T24 has larger upper-middle tropospheric warming compared to RSS and UAH (tables 1 and 2) and that other analyses that use temperature trends derived from wind measurements have found that historical tropical tropospheric warming is largely consistent with GCM results (Allen and Sherwood 2008). 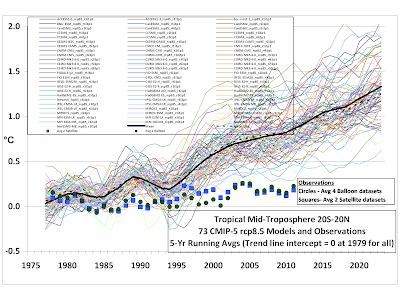 In general, the comparison of model and observed trends over a relatively short time period has large uncertainties, so some of the discrepancy noted here may also be related to the length of the datasets. Brian over at Eli Rabett's place also speculated about the above paper and the accuracy of the UAH temperature data set back when it first came out. In the comments BBD points out that UAH is similar to surface-based data series for the tropics. What game is John Christy playing? It's worth reading the comments below. For example, BBD has pointed out that Christy compared his tropical mid-troposphere data with the most extreme scenario, RCP 8.5 among other useful observations. Wotts up with that blog made an interesting comment about questions raised by David Appell. John Christy seems to be playing a game. Maybe it was a reaction to the above paper and maybe to the 97% consensus paper and the Marcott et al study also. What game is Roy Spencer playing? First, as Barry Bickmore demonstrates, it's ridiculous to suggest that any climate scientists, whether a 'modeler' like him or anyone else, maintains there is no such thing as natural climate change. How does he think scientists have worked out what forces and feedbacks affect climate? It's just as ludicrous to suggest any particular aspect of climate studies are rejected on the basis of whether it is a 'natural' force or a 'supernatural' force :D Okay - maybe a study with the objective of determining how God influences climate wouldn't get much of a hearing. Spencer discounts the entire field of climate science if he thinks 'natural forces' aren't the basis of it all. Whether it's the way greenhouse gases affect climate, studies of clouds, oceans, the biosphere or any other aspect. All of it is "natural". What is arguably unnatural is the way humans are affecting the 'natural' climate by digging up carbon and putting it into the air at such a fast rate. Probably more in a single year than one or two supervolcanoes would emit. Not only that, but one has to ask Roy Spencer, just what do his satellites cost the taxpayer? What about the salaries of himself and John Christy and any offsiders they may have, their administrative support and corporate overheads, and all their accommodation, equipment, conference attendances, travel allowances and the like? 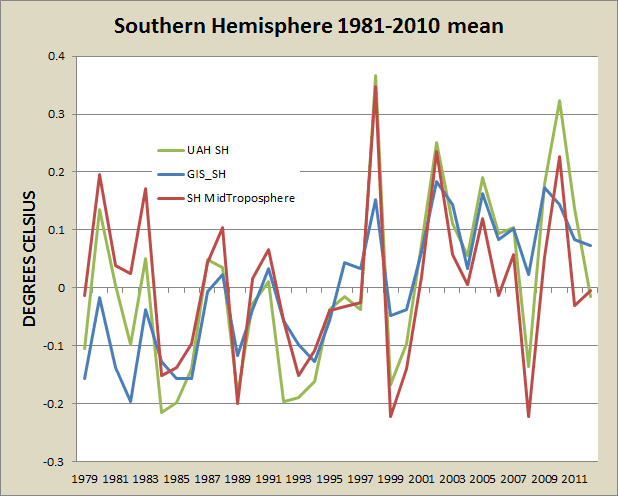 I've put together some charts comparing UAH near surface** to UAH mid-troposphere** and GISTemp**. Click to see larger versions. 3. Tropics - note GISTemp tropics is 24N-24S, whereas I believe UAH is 30N to 30S, but I'm not sure about that. I can't say much about them except to note that UAH in the southern hemisphere in particular (and the tropics to a lesser extent) has much greater extremes than does GISTemp (1979-83, 1998-99, 2008 and 2010). This surprises me, because I would have thought the southern hemisphere ocean would have modified the swings a great deal. 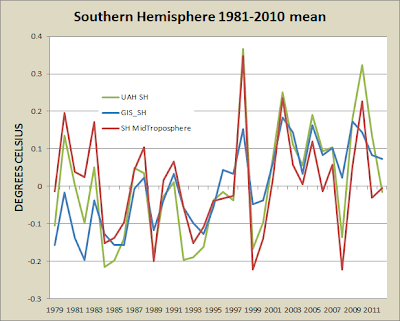 In fact if you look at the southern hemisphere overall, UAH looks to be quite a bit different to GISTemp. 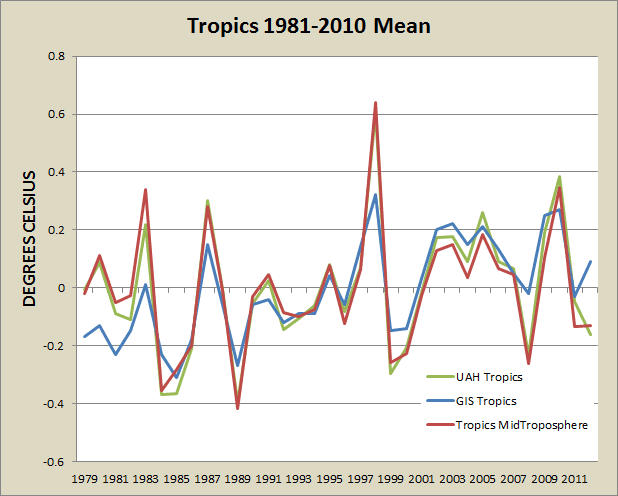 Also, the early years in UAH don't accord with GISTemp very well in the tropics or the southern hemisphere. PS I'm not in a position to know how accurate UAH data is over time. However the suggestion that Christy used RCP 8.5 on purpose, and possibly when it's not appropriate to run it back to a single point and aligning it with the UAH point, is persuasive. Thanks, Ryan. Thought it looked very odd. There was an article on realclimate recently about regional modelling IIRC. I'll see if I can dig it out. Anthony and Christy and Spencer are a bit weird. I wonder does Anthony know they aren't global? He certainly didn't mention it. A bunch of commenters seem to think it is global. It's kind of a moron-farm over there. I think the term climate creationist applies very well to Spencer. He thinks God built the atmosphere to be self-correcting, and he probably always will. Thanks, BBD. It still could be either the data is wrong or the models are wrong or both. I've added another update with a paper I found discussing a similar but, from the look of it, a not identical issue. I expect if there were discrepancies in other areas then Christy and Spencer would have highlighted them. So I'm thinking it probably is the same issue discussed in the paper above. And it still could be either the satellite data that's out of whack or the models or both. As David Appell has pointed out on Quark Soup, the measurements that Roy plots in his figure are also (I think) an average of the RSS and UAH measurements. According to David, the RSS data has a trend of 0.09 +- 0.028 degrees celsius per decade (I had a quick look at the data and this seemed plausible) while the UAH data has a trend of 0.03 +- 0.028 degrees celsius per decade. So what Roy seems to end up with are measurements with a trend of about 0.05 degrees celsius per decade. Of course, I don't know which of the datasets is correct (if either) but the RSS data would seem to be in reasonable agreement with some of the models. One thing I did notice is that S & C are using MID troposphere not the usual top-of-lower-troposphere (TLT). Temperature estimates for each altitude are calculated differently. See RSS MSU data description page (scroll down). Figure 2. Two example scans for the MSU instrument. The satellite is traveling in the South to North direction, and scanning (roughly) West to East, making 11 discrete measurements in each scan. Footprints used to construct the near-nadir MSU products (TMT, TTS, TLS) from the top scan are shown in green. The numbers in each footprint are the weights assigned to the footprint when constructing the average for a given scan. The footprints used to construct TLT are shown in red and blue in the lower scan, with red denoting negative weight. Green = TMT. Red and blue = TLT. A faint alarm bell is ringing now. AFIK, the MID troposphere is NOT the "bulk troposphere" at all. It is what it says it is: the cooler MID troposphere. My second question is: exactly what atmospheric altitude (or range) is being shown IN THE MODEL PLOTS? We produce 3 single-channel MSU/AMSU datasets (TMT, TTS, and TLS) that extend back to late 1978, and 5 single channel AMSU-only datasets (C10, C11, C12, C13, and C14) that begin in mid 1998. TLT is a more complex dataset constructed by calculating a weighted difference between measurements made at different Earth incidence angles to extrapolate MSU channel 2 and AMSU channel 5 measurements lower in the atmosphere. I wondered the same thing myself. It wasn't clear that Roy really is comparing the same things. I don't know enough about the models to really know if the models are indeed modelling the mid-troposphere. I think I'm beginning to see the light here. I've added some more to the above article as an addendum. I've added some more comments above as a postscript. In particular, pointing out that aligning the model runs with the first 1979 UAH data point may well be invalid for more than one reason. The S&C graph is indeed using TMT (known contamination with the stratosphere) rather than the weighted TLT (developed by Christy and Spencer, in fact, to avoid said contamination and provide a more accurate tropospheric reading). For shame - not using the corrected data he himself developed! I have to consider that a deliberate and deceptive choice. He also averaged the UAH and RSS TMT values, which are 3x different - as noted elsewhere, more than 2-sigma different, which hides the fact that UAH TMT is a serious outlier. RCP 8.5 is what is recommended for CMIP5 runs; that's probably not an outrageous choice. Side note: the satellite data has been shown to be more sensitive to variation than surface data, as per Foster and Rahmstorf 2011; the differences in extrema against GISTEMP are only to be expected. Gee, record snow in Brazil, Europe and Russia, ice at or above norms at both polls. Temps have flat- lined. Could the climate be cooling?